WIN an LG curved OLED TV worth £8000! | What Hi-Fi? WIN an LG curved OLED TV worth £8000! Here's your chance to win a cutting-edge curved-screen OLED TV from LG worth a whopping £8000! Wow have we got the ultimate Christmas competition for you! 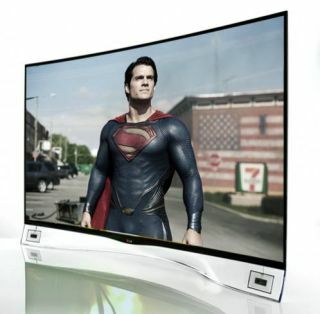 Here's your chance to win a cutting-edge curved-screen OLED TV from LG worth a whopping £8000! We've just tested one and published our full verdict online, as you can read in our in-depth LG 55EA980W review. We said: "Stunning black levels, punchy highllghts and a natural touch with colours make this LG OLED a great first effort. "Watching Pacific Rim on Blu-ray, black levels are stunning. They're properly dark, inky-deep and solid – far more than we've previously seen on Full HD LCD and plasma sets. "In contrast, white levels are bright and punchy. The picture as a whole is clean, detailed and has a natural colour balance. It’s lovely to watch." To enter this amazing competition, just head on over to the LG - How To Live It website by clicking here and follow the instructions on the page. Good luck!